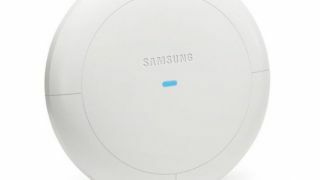 Samsung has unveiled a key cog to its enterprise Internet of Things (IoT) offering in the shape of an access point. First reported by Business Korea, the device supports three of the most widely used connectivity standards in the world of enterprise IoT devices and as such can cater to 70% of the total wireless communication currently fed through IoT-enabled smart devices. The fact that it supports Wi-Fi and Bluetooth isn't particularly remarkable, but it's the support for the ZigBee standard that sits at the very heart of the IoT and Bluetooth low energy that sets it apart from competitors. Developed by the ZigBee Alliance, ZigBee is a wireless standard used by devices to communicate with each other that is said to be secure, reliable and interoperable plus crucially for IoT firms it uses up minimal amounts of power. It is also less expensive to implement than both Bluetooth and Wi-Fi. When it comes to Wi-Fi, the new IoT Access Point support's 802.11ac and as such can provide wireless LAN services up to 1.3Gbps. It can be used for everything from controlling lighting to the management of energy in an entire office building. The enterprise case for the IoT is an absolute no brainer given that the sector will be worth an estimated $8.9 trillion (around £5.7 trillion, or AU$12.49 trillion) by 2020 and be responsible for some 212 billion connected things. By providing an access point and platform for those devices to thrive, Samsung looks set to benefit from a substantial slice of that. Which is the best Internet of Things platform?